It’s hard to write some historical comment on a armoured fighting vehicle (AFV) that has never been produced. And as far as it’s being known, no German engineer has ever thought of producing this weapon. The Flak 40 Zwillingsflak on a E-100 hull is a mere idea of the Chinese modelling company Modelcollect. It has to be said however, it’s a fine idea for those who like the concept of ‘paper panzers’. Even though the Flak 40 Zwillingsflak on a E-100 hull is fantasy, both the gun and the hull have existed. 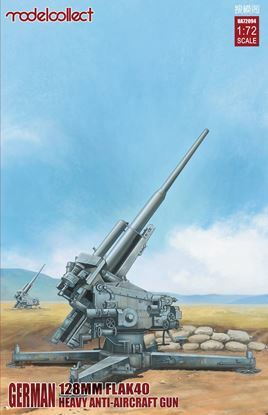 The Zwillingsflak was the most powerful anti-aircraft gun the Germans ever produced. Some 34 were produced and all of them were placed on top of specially designed anti-aircraft towers, as they could be found in Hamburg, Berlin and Vienna. Pictures prove that at least one Zwillingsflak was also used in the defence of the French port of Brest. The E-100 hull on the other hand was a part of a German attempt to rationalize their tank production. The Germans had so many different types of tanks that logistics and maintenance were a nightmare. Besides, all these tanks and AFV’s were produced in rather small numbers. Under supervision of the Minister of War Production Albert Speer, the Germans took up the plan to simplify all this. The aim was to concentrate on six types of tanks, which would be produced in larger quantities. Each type would use as much of the same parts as the other types, thus simplifying logistics and maintenance. The new tanks would be classified as the E-range, the ‘E’ meaning ‘Einheit’ or ‘Standard’. According to their weight, the E-tanks would be: E-5, E-10, E-25, E-50, E-75 and E-100. However, the war ended before any of these tanks were produced. The E-100 was the only type on which the Germans had made some progress. 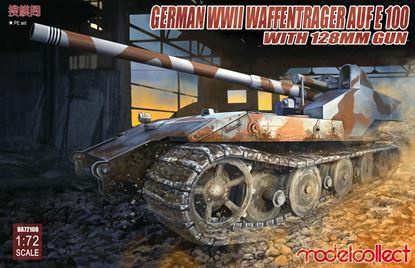 At the end of the war, the British discovered an unfinished hull and suspension system and the 1 meter wide tracks. The thing would have been even larger than a Tiger tank, but with the same engine. This means it would have been a very slow vehicle, consuming lots of fuel and probably prone to frequent breakdowns. With the Zwillingsflak on top of it, things would probably not have improved. 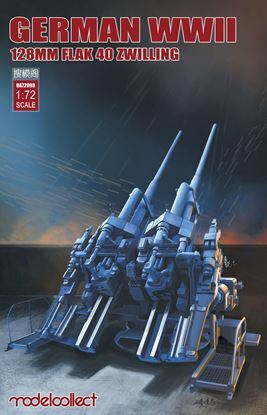 The centre of gravity would have been to high, resulting in a rather unstable firing platform while the force of the guns would have put a serious strain to the suspension system. So, no wonder the Germans never have thought to produce this vehicle. For modellers who like ‘paper panzer’ though, Modelcollect’s Flak 40 Zwillingsflak on a E-100 hull is a honey. 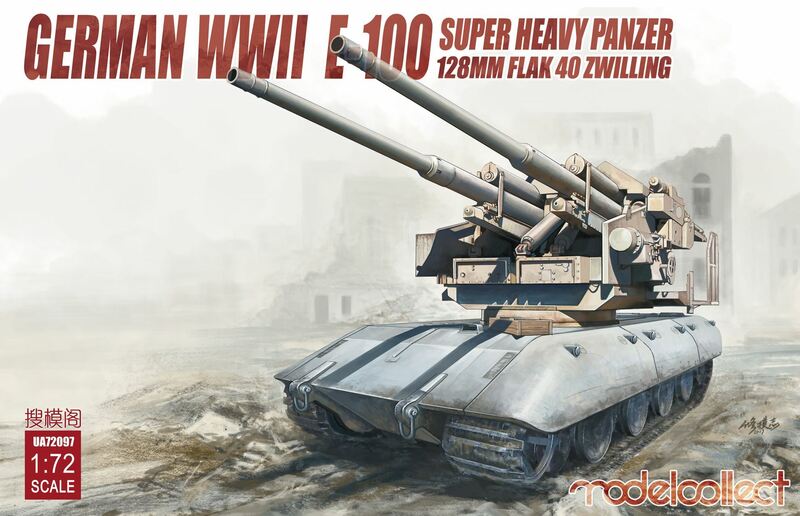 The kit offers you both the impressive Zwillingsflak and the E-100 hull. This means you will find not less than nine (!) sprues in the box a little PE-fret. It is easy to unpack, but not easy at all to put it back in the box again! The box offers you the choice for two types of suspension. The instructions suggest that you should use a fixed suspension. This means you should use two parts with a pre-made suspension. You only have to add the wheels. However the kit offers also all parts to make a movable suspension. In this case, you have to assemble some 30 parts for each side. The kit offers no instructions for this option however. You will have to find it out for yourself, in which the fixed suspension gives you a useful example. Although more demanding, the movable suspension on the other hand gives more opportunities to create a more vivid model, especially when placed on a diorama. Figure this beast move over piles of ruins of a battered city and you will win all prices in a modelling contest! The hull of the E-100 is also very detailed, figuring e.g. even the electrical wire to the front light of the tank. In your box you will even find the parts to make a HL230 Maybach engine, together with its cooling system. You can even show the engine compartment with its hatch open. The crucial parts of the kit are the impressive gun barrels. Unlike some other kits in the Modelcollect range, you do not get a metal barrel. You will have to glue two halves together, with the inevitable task to make the joint invisible. Luckily, the parts fit well and give only a small joint. By successively sanding with 2000, 4000 and 6000 sanding paper, I was able to remove the joint quite easily. The same has to be done with the gun’s elevation mechanism and breach blocks. The latter is somewhat more difficult, but luckily the joint in the breach blocks can be camouflaged behind another part. The only real drawback of this kits are the tracks. They are made of vinyl, which always has a tendency to deform when placed over the drive sprocket. The joint between the two halves is also a bit crude, but this can easily be hidden behind the side skirts of the E-100.